Every morning at 8 am, 45-year-old Josephine Nabyalu walks to the street corner outside her house to start her work day. The former teacher runs a small “canteen” – a wooden shack with fresh vegetables, french fries and boiled corn for sale. When the sun begins to settle, she pulls out her BrightLife solar lamps and places them strategically throughout the stall to highlight her fresh produce. She continues selling to her neighbors, school children and passersby until the late evening. The hours are long, but Josephine doesn’t complain one bit, as she knows her business is helping to support her family. She started her stall in 2010 in Wakiso, Uganda, after she quit her job as a nursery school teacher because of the low salary. She needed more income to help pay for her three children’s higher education. Thankfully, her sister, Harriet, introduced her to FINCA. 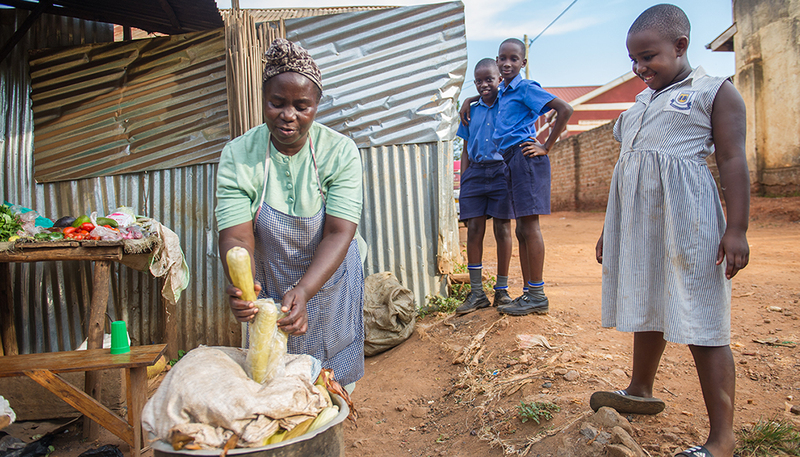 With her first loan of 50,000 shillings ($22 USD), Josephine was able to purchase a few vegetables to sell at her stall. Today, her loan size has grown to 1,000,000 shillings ($280 USD) which she uses to stock her stall with tomatoes, potatoes, eggplants, corn and more. Slowly, Josephine started to save money for her kids’ university fees. But Josephine did have one problem with her business. She used toxic kerosene lamps to light her stall. It was risky to use the kerosene lamps. At times, the smell would be so strong that customers would stay away. The kerosene lamps would often leak and contaminate her fresh produce, causing her to lose money. There was also a risk of damaging her shop, made up of thin wooden slats. The light they emanated wouldn’t last long either, and often Josephine closed her shop before it got too dark. In 2014, Josephine learned about FINCA’s BrightLife solar lamps and received six of them. She keeps three at her stall and one at home (in case the electricity goes out). The remaining were given to relatives. Each lamp provides up to thirty-six hours of light on a day’s charge and is 16 times brighter than a kerosene lamp. 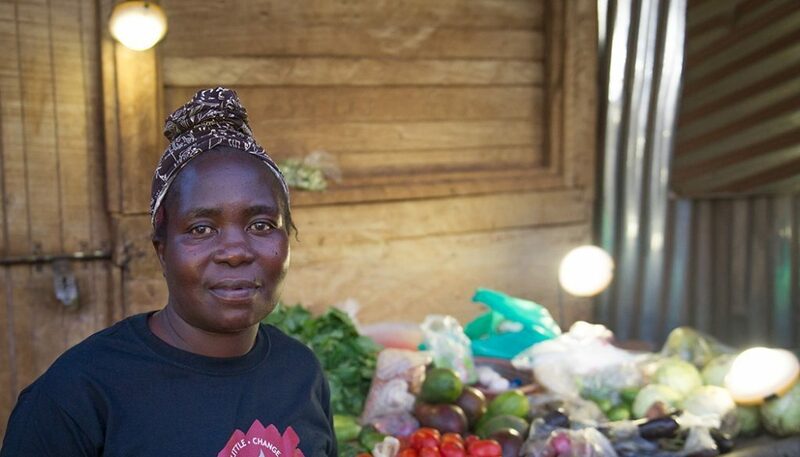 “There is now enough light to attract customers to my business,” she says of her solar lamps. Thankfully, Josephine no longer has to sacrifice safety in her small business. With her BrightLife solar lamps, she keeps the stall open longer to 10 pm, which helps to generate more sales. She estimates that she saves about 500 shillings a day from not purchasing kerosene lamps. Her lamps also double as a phone charger, enabling her to charge her mobile phone at the stall where there are no electricity sockets. When the electricity goes out in her community, her neighbors ask to charge their mobile phones on her solar lamps too. Josephine is proud of what she accomplished for her family over the last seven years. And she is planning on helping her family even more. She and her husband are saving to build a home nearby for rentals for extra income. Whatever savings I generate is all for the family.